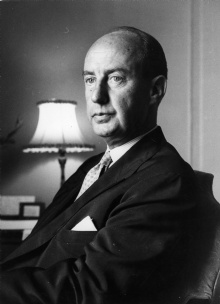 Adlai Stevenson was a famous Politician from USA, who lived between February 5, 1900 and July 14, 1965. He became 65 years old. Adlai Ewing Stevenson II (born in Los Angeles, California, USA, died in London, UK) was an American Democratic politician. He was known for being a good debater and speaker. He lost the presidential election both times he ran for president in 1952 and 1956, the war veteran Dwight D. Eisenhower. His grandfather Adlai E. Stevenson had previously been Vice President under President Grover Cleveland. He attended Princeton University from 1918 to 1922, then at Harvard Law School, but without quitting the program. Stevenson became interested in politics around 1930, especially foreign policy. In 1948 he became governor of Illinois, a post he held until 1953. At the election in 1960 he supported John F. Kennedy, who subsequently appointed him ambassador at the United Nations, a post he made his mark in the Cuba crisis and that he kept the last four years of his life. He died suddenly during a short stay in London. He is born under the zodiac aquarius, who is known for Knowledge, Humanitarian, Serious, Insightful, Duplicitous. Our collection contains 16 quotes who is written / told by Adlai, under the main topic Sports. "To me, there is something superbly symbolic in the fact that an astronaut, sent up as assistant to a series of computers, found that he worked more accurately and more intelligently than they. Inside the capsule, man is still in charge"
"Patriotism is not a short and frenzied outburst of emotion but the tranquil and steady dedication of a lifetime"
"We live in an era of revolution, the revolution of rising expectations"
"There is no evil in the atom; only in men's souls"
"The New Dealers have all left Washington to make way for the car dealers"
"I will make a bargain with the Republicans. If they will stop telling lies about Democrats, we will stop telling the truth about them"
"A funny thing happened to me on the way to the White House"
"Nixon is the kind of politician who would cut down a redwood tree, then mount the stump for a speech on conservation"
"A free society is a society where it is safe to be unpopular"
"With the supermarket as our temple and the singing commercial as our litany, are we likely to fire the world with an irresistible vision of America's exalted purpose and inspiring way of life?" "In America any boy may become President, and I suppose it's just one of the risks he takes!" "We cannot be any stronger in our foreign policy for all the bombs and guns we may heap up in our arsenals than we are in the spirit which rules inside the country. Foreign policy, like a river, cannot rise above its source"
"The Republicans have a me too candidate running on a yes but platform, advised by a has been staff"
"The idea that you can merchandise candidates for high office like breakfast cereal that you can gather votes like box tops is, I think, the ultimate indignity to the democratic process"
"Freedom is not an ideal, it is not even a protection, if it means nothing more than freedom to stagnate, to live without dreams, to have no greater aim than a second car and another television set"